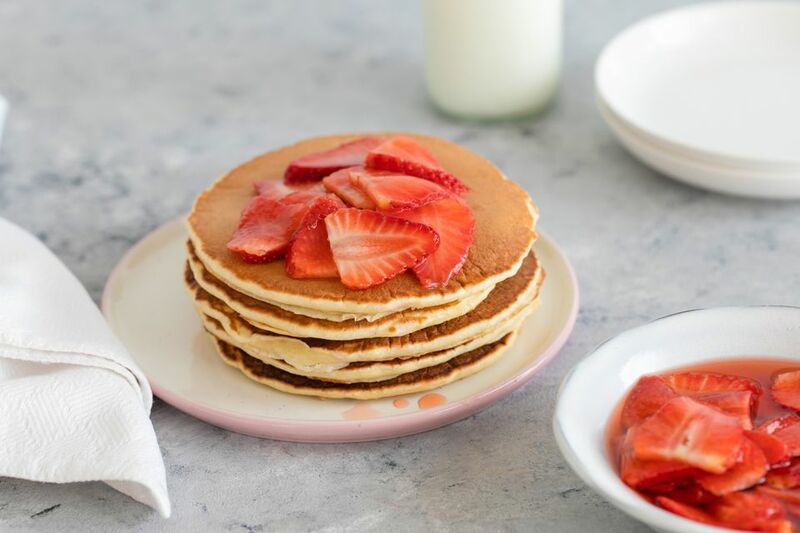 Layers of fresh sliced sweetened strawberries make these pancakes extra special. What better way to enjoy a weekend morning than with a plate of pancakes layered with fresh, juicy strawberries? These pancakes are made with a basic formula, and the macerated strawberries are simply prepared with sliced strawberries and granulated sugar. Check out the variations below to add a twist on the classic version. In a bowl, combine the flour, baking powder, 2 tablespoons sugar, and salt; stir to blend. In another bowl, whisk eggs with 1 1/2 cups of milk. Stir into the flour mixture along with the melted butter and vanilla. Add a little more milk if the batter is too thick. Stir just until smooth and well blended. Using about 1/4 cup of batter for each pancake, cook on a hot, greased griddle. Cook until bubbly and lightly browned on the bottom. Then, flip over with a spatula and brown the other side. Layer the pancakes with the sliced strawberries and serve them with your favorite syrup. To keep subsequent batches of pancakes warm, heat the oven to 200 F. Place pancakes on a platter or baking pan in the preheated oven and cover loosely with foil while you make the remaining pancakes. After 30 to 45 minutes, cover the strawberries and refrigerate until serving time. Orange Pancakes: To the dry ingredients, add 1 teaspoon of finely grated orange zest and 1/4 cup of orange juice. Reduce the milk by about 1/4 cup. Fluffy Pancakes: Separate the eggs. Make the batter with the egg yolks. Beat the egg whites to stiff peaks and then fold them into the pancake batter until blended. Add 2 tablespoons of Cointreau or Grand Marnier to the strawberries and reduce the sugar to 2 tablespoons. Add 2 tablespoons of fresh orange juice or lemon juice to the sliced strawberries and reduce the sugar to 2 tablespoons. Make the sauce with 1 cup of sliced strawberries and 1 cup of fresh blueberries. Add 1/4 cup of granulated sugar and let stand for 45 minutes. Add sliced bananas to the layers with the strawberries. Tired of Matzo? Passover Pancakes to the Rescue!